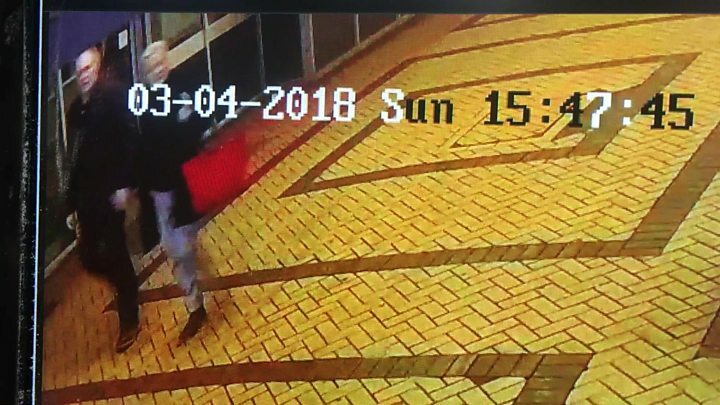 The woman found slumped on a shopping centre bench alongside a former Russian agent convicted of spying for Britain is his daughter, it has emerged. Yulia Skripal, in her 30s, and father Sergei, 66, are critically ill in hospital after being found unconscious in Salisbury, Wiltshire, on Sunday. UK police are trying to find out what "unknown substance" harmed the pair. A number of emergency services workers were assessed immediately after the incident - and one remains in hospital. Russia insists it has "no information" on what could have led to the incident, but says it is open to co-operate in the police investigation if requested. Former agent Mr Skripal, whose wife, son and older brother have all died in the past two years, was granted refuge in the UK following a "spy swap" in 2010. "We see this tragic situation but we don't have information on what could have led to this, what he was engaged in," he said. Police are currently examining CCTV footage, filmed by a Salisbury gym, showing an unidentified man and woman walking near to the location where Mr Skripal and his daughter were found. 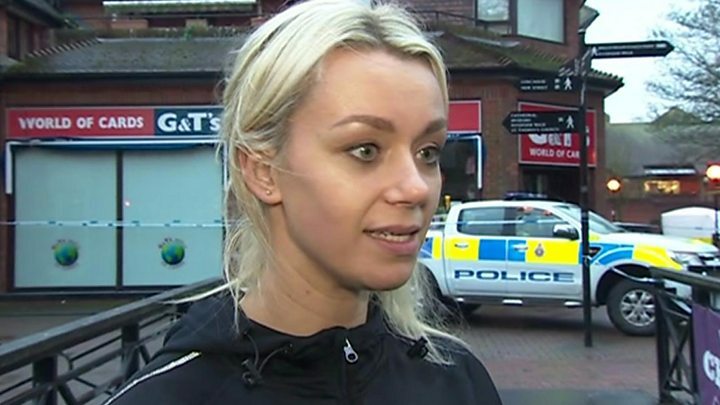 Wiltshire Police said the pair, found at The Maltings shopping centre in Salisbury, had no visible injuries - but that officers were investigating whether a crime had been committed. Temporary Assistant Chief Constable Craig Holden said the police's "major incident" response was not a counter-terrorism investigation - but that multiple agencies were involved and they were keeping an "open mind". Meanwhile, police have cordoned off a nearby Zizzi restaurant and The Bishop's Mill pub "as a precaution". Col Skripal, a retired Russian military intelligence officer, was jailed for 13 years by Russia in 2006. In July 2010, he was one of four prisoners released by Moscow in exchange for 10 Russian spies arrested by the FBI as part of a swap. He was later flown to the UK. Read more about Sergei Skripal's background here. An eyewitness, Freya Church, told the BBC she saw the pair sitting on the bench: "An older guy and a younger girl. She was sort of leant in on him, it looked like she had passed out maybe. "They looked so out of it I thought even if I did step in I wasn't sure how I could help." Media captionWitness: "They looked like they'd been taking something quite strong"
The possibility of an unexplained substance being involved has drawn comparisons with the 2006 poisoning of Alexander Litvinenko. The Russian dissident and former intelligence officer died in London after drinking tea laced with a radioactive substance. A public inquiry concluded that his killing had probably been carried out with the approval of the Russian President, Vladimir Putin. Mr Litvinenko's widow, Marina Litvinenko, told BBC Radio 4's The World Tonight the latest incident felt like "deja vu" - and called for those receiving political asylum to be "completely safe". She said: "It just shows how we need to take it seriously, all of these people asking for security and for safety in the UK." The parallels are striking with the 2006 Litvinenko case. He, too, was a former Russian intelligence officer who had come to the UK and was taken ill for reasons that were initially unclear. In that case, it took weeks to establish that the cause was deliberate poisoning, and it took close to a decade before a public inquiry pointed the finger of blame at the Russian state. Officials are stressing that it is too early this time to speculate on what happened here or why. The police are not even yet saying a crime has been committed, but if the similarities do firm up and Moscow is once again found to be in the frame there will be questions about what kind of response might be required - and whether enough was done in the past to deter such activity being repeated.